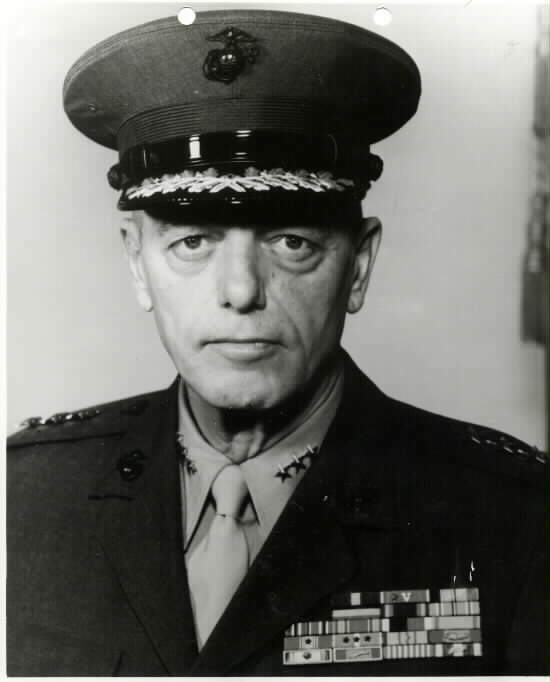 Lieutenant General Adolph G. Schwenk retired from the Marine Corps on 1 July 1982. General Schwenk was presented the Distinguished Service Medal (Gold Star in lieu of a second award) upon his retirement for, "Exceptionally meritorious service to the Government of the United States in a duty of great responsibility as Commanding General, FMF, Atlantic; Commanding General, II Marine Amphibious Force; and Commanding General, FMF, Europe (Designate) from October 1980 through June 1982. General Schwenk was born 26 March 1922, in New York City. He attended Wesleyan University, Middleton, Connecticut, prior to enlisting in the Marine Corps Reserve in September 1942. He attended Yale University under the V-12 program until February 1944, when he was sent to Parris Island, South Carolina, and subsequently was commissioned a Marine Second Lieutenant, 26 July 1944. He completed the Reserve Officers' Course, Marine Corps Schools, Quantico, Virginia, in October 1944, and was transferred to Marine Corps Base, Camp Pendleton, California, where he joined the 39th Replacement Draft for deployment overseas. He served in the Pacific as a platoon commander with the 3d Battalion, 25th Marines, 4th Marine Division, and later became Special Services Officer, Headquarters V Amphibious Corps, Fleet Marine Force, Pacific. He was promoted to First Lieutenant in January 1946, and reassigned as Aide-de-Camp to the Commanding General, V Amphibious Corps. He later served consecutively as a company commander and company executive officer, 2d Battalion, 1st Marines, in Peiping and Tientsin, China. Returning to the United States in December 1946, General Schwenk was assigned as a Company Officer, 3d Marine Brigade, Camp Pendleton. He remained in that billet until March 1947, when he was transferred to Marine Barracks, Norfolk Naval Shipyard, Portsmouth, Virginia, as Post Exchange Officer. From November 1949 to May 1952, he was assigned to the Marine Corps Institute, Washington, D.C. He was promoted to Captain in January 1951. General Schwenk participated in combat operations in Korea as a company commander and later, as Assistant S-3 Officer, 7th Marines, 1st Marine Division. He was awarded the Legion of Merit with Combat "V" for exceptionally meritorious service while serving in Korea. He returned to the United States in August 1953, and completed the Amphibious Warfare School, Junior Course, Marine Corps Schools, Quantico. The following June he was assigned as Officer Procurement Officer, Marine Corps Recruiting Station, Washington, D.C. He was promoted to Major in December 1954. From June 1957 to August 1959, General Schwenk served in the Office of the Naval Attache, Rome, Italy, when he was ordered to the 2d Marine Division, Camp Lejeune, North Carolina, and served successively as Battalion S-3 Officer and Battalion Executive Officer, 1st Battalion, 8th Marines; Assistant G-3 Officer, 2d Marine Division; and as Commanding Officer, 3d Battalion, Sixth Marines. Promoted to Lieutenant Colonel in June 1962, he was detached from Camp Lejeune the following August and entered Wesleyan University, where earned his B.A. degree in June 1963. General Schwenk was next assigned duty as Assistant to the Assistant Chief of Staff, G-2, 1st Marine Aircraft Wing, Iwakuni, Japan. He was ordered to Headquarters Marine Corps in July 1964, as Head, Ground Officer Control Unit, Personnel Department, remaining there until June 1967, when he joined the 5th Marine Division, headquartered at Camp Pendleton, as Assistant Chief of Staff, G-2. He was promoted to Colonel in July 1967. In February 1968, he assumed command of the 27th Marines, and deployed with Regimental Landing Team 27 to South Vietnam. He later served as Assistant Chief of Staff, G-3, with the 1st Marine Division. For his service in Vietnam, he was awarded a gold star in lieu of a second Legion of Merit with Combat "V". General Schwenk returned to the United States in April 1969, as Assistant to the Assistant Chief of Staff, G-3, Camp Pendleton. He attended the Army War College, Carlisle Barracks, Pennsylvania, from July 1969 to June 1970, and upon graduation, was assigned to Headquarters Marine Corps as Head, Plans and Operations Branch, Office of the Assistant Chief of Staff, G-4. Following his advancement to Brigadier General in August 1971, he was ordered to Camp Pendleton as Assistant Division Commander, 1st Marine Division. In August 1972, he was reassigned as Commanding General of the Division, and in May 1973, resumed his former duty as Assistant Division Commander, remaining in that billet until November 1973, when he returned to Headquarters Marine Corps as Director, Facilities and Services Division, Installations and Logistics Department. He was advanced to Major General on 12 March 1975, and assigned duty as Director, J-3, Headquarters, U.S. European Command, the following July. On 16 July 1977, he assumed duty as the Commanding General, III Marine Amphibious Force, Commanding General, 3d Marine Division, on Okinawa. Upon promotion to Lieutenant General on 1 October 1978, he was assigned duty as Deputy Chief of Staff for Plans, Policies and Operations, Headquarters Marine Corps. He assumed duty as Commanding General, Fleet Marine Force, Atlantic at Norfolk, Virginia, on 1 October 1980. He served in this capacity until his retirement on 1 July 1982. General Schwenk died on 24 March 2004 in North Carolina and was buried with full military honors in Arlington National Cemetery, 14 April 2004. Of Pinehurst died Wednesday, March 24, 2004 at Womack Army Medical Center in Fayetteville, North Carolina. Born in New York City, New York, to the late Gustav and Katherine Holer Schwenk, he was a gradaute of Wesleyan University in Middletown, Connecticut, and the Army War College. He served in the U.S. Marine Corp for 39 years in World War II, Korea and Vietnam retiring with the rank to Lieutenant General. He commanded every level from the Infantry Platoon to the Marine Expeditionary Force. He and his wife retired to Pinehurst in 1982 to enjoy his passion for golf and he was active on the Marine Corp League and the Pinehurst Country Club. He is survived by his wife of 56 years, Mary Ann Schwenk; his two sons, James R. Schwenk of Manassas, Virginia, and R. Michael Schwenk of Richland, Washington; his brother, Gustav Schwenk of South Carolina; his two sisters, Marie Trimble and Elsie Taylor brother of Florida and four grandchildren, Brian, Stephen, Stacey and Mary. Graveside services will be in Arlington National Cemetery on Wednesday, April 14, 2004 at 3 p.m. with Full Military Honors. In lieu of flowers memorials may be made to the Marine Corp League, 27 Middleton Pl., Southern Pines, North Carolina 28387.